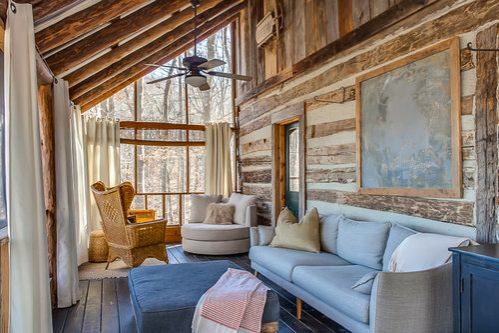 Tucked in a rural retreat overlooking Center Hill Lake in Tennessee, this group of two luxury cabins and a chic treehouse creates a dreamy retreat that offers every amenity deep within nature. 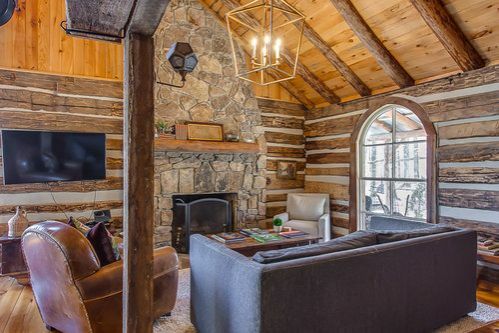 Situated on 12 wooded acres, the private property features several smaller spaces that together can sleep 14 guests — the perfect mix of togetherness and privacy. 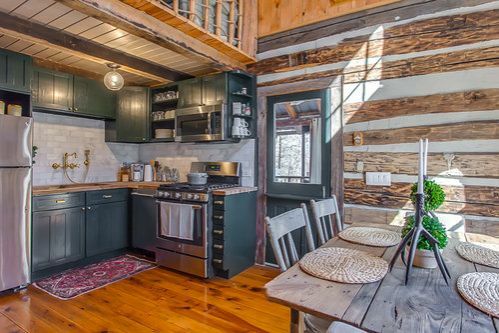 Pioneer-built cabins offer charm in spades, and Tennessee retreat collective House + Sanctuary has outfitted them with every modern necessity. 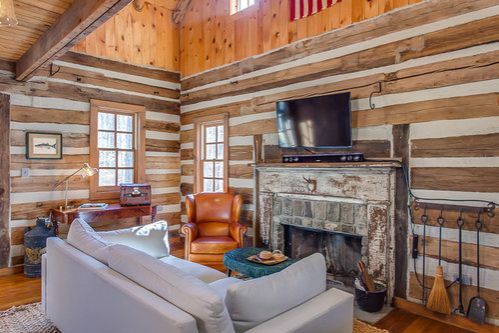 In the main cabin, the living room features original wood beams and a stone hearth fireplace. A large sofa and comfy leather armchair face a flat-screen TV, equipped with cable and WiFi. The kitchen features stainless steel appliances including a full stove, oven and refrigerator. A white subway tile backsplash is paired with teal green cabinetry and butcher block countertops. An antique brass faucet is at home in the vintage aesthetic. The screened-in porch offers panoramic views of the hilltop and lake. 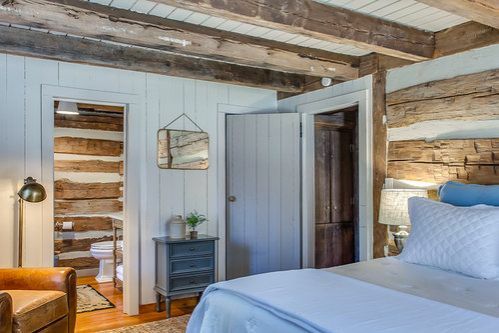 Vertical shiplap siding and exposed beams on the walls and ceilings complete the rustic look in the master bedroom. 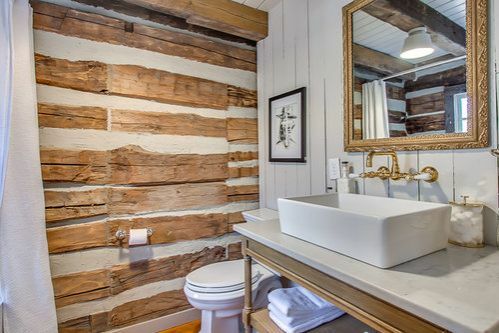 A spacious bathroom features a farmhouse vessel sink and freestanding tub, outfitted with antique brass fixtures. 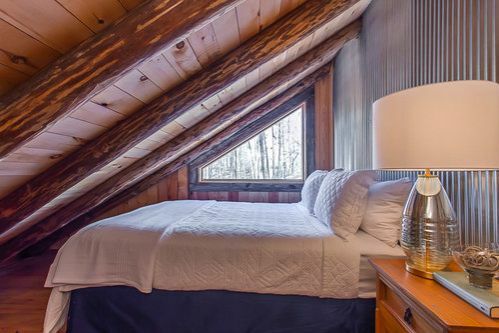 An additional loft sleeping area upstairs includes original log beams. 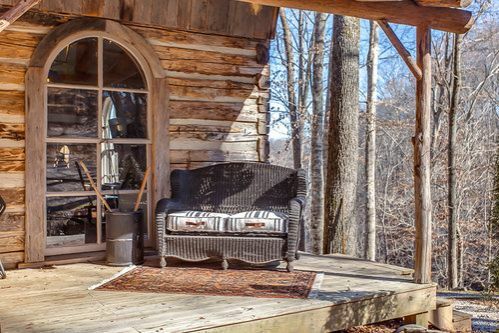 On the porch, a cozy seating area overlooks the wooded grounds. 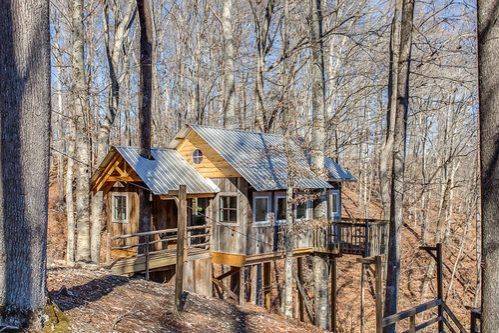 The dreamy treehouse offers a private respite above the forest floor. 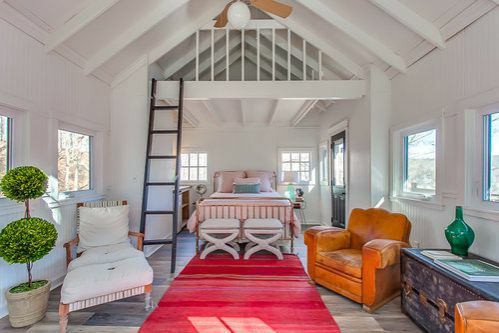 It features a large studio layout with a queen-sized brass bed, seating space and loft storage area. There isn't a full kitchen, but there is a Keurig coffee station and small fridge. 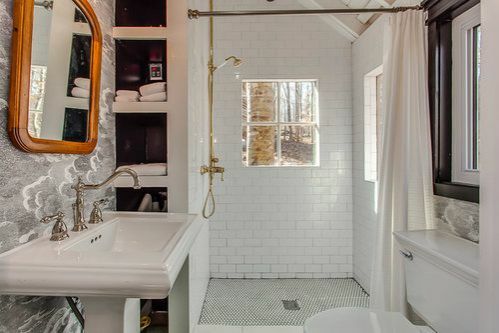 The bathroom features a free-standing shower and antique pedestal sink, both with antique brass fixtures. 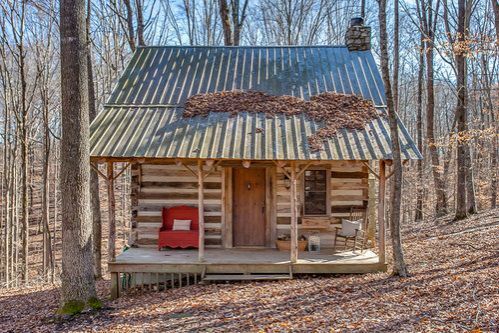 The last cabin features a rustic exterior, tin roof and roomy front porch. The main living area features a large fireplace and seating area facing a flat-screen TV. High ceilings feature exposed beams, as do the original concrete-and-beam walls. 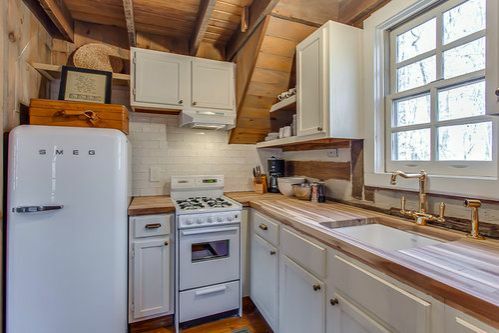 A vintage Smeg refrigerator is at home in the rustic kitchen, which has butcher block counters, a small stove and a brass faucet over the large farmhouse basin sink. 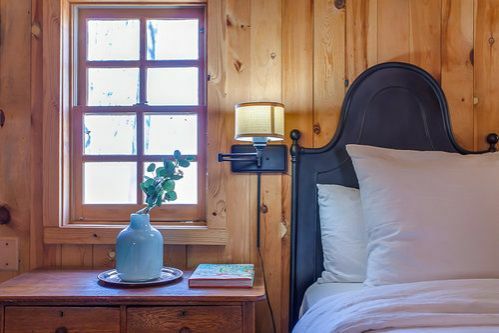 Vertical wood siding offers an unfinished look in the bedroom, accented by vintage lamp sconces flanking the bed. 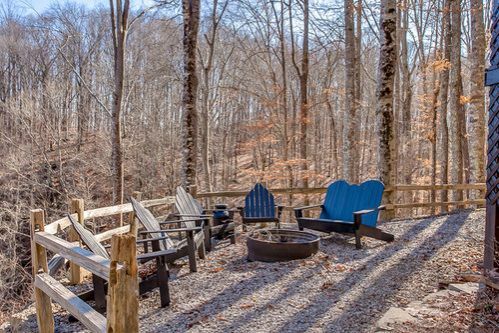 Outside, Adirondack chairs surround a fire pit. 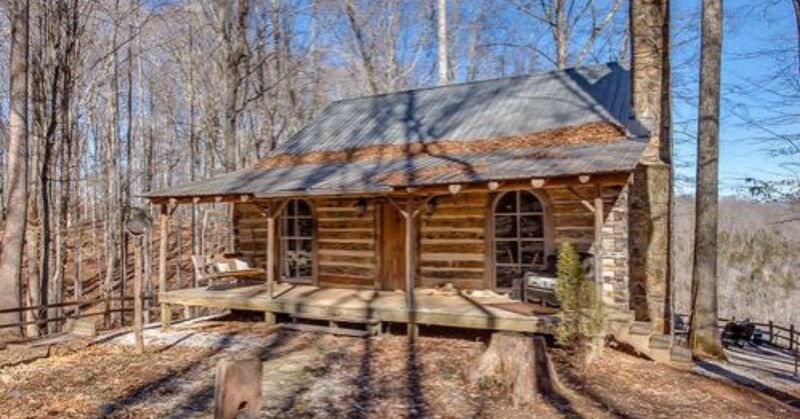 The site also boasts an outdoor shower, horse shoes and hot tub.